Downloadable network analyzers, remote access apps and testing utilities turn your iPhone and Android smartphone into powerful network tools. When maintenance is required, network pros most often make changes from a desktop PC or laptop. But an iPhone or Android phone can be just as powerful. The right apps can turn a smartphone into a diagnostic asset that lets you scan networks, remotely administer systems and more. There are tons of network utilities that you can download from the Apple App Store and Google Play store. We’ve zeroed in on a handful of standouts that have the highest ratings, most downloads and approval of the pros. Fing is a multipurpose tool. It's a network scanner that finds and lists devices connected to your office LAN or Wi-Fi network, and you can see information about them, such as device name, IP address, MAC address and manufacturer. Fing (available on the App Store and Google Play) has a step-by-step guide to help you diagnose and fix issues with your network. 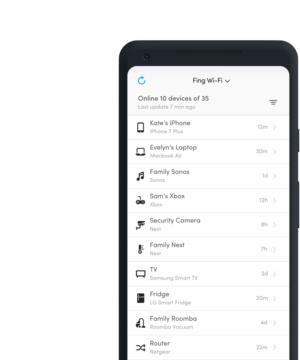 For security purposes, you can have Fing alert you when a device connects to your Wi-Fi network. Fing can identify connected devices, troubleshoot network and device issues, and detect network intruders. It has several more tools, including: an analyzer for services on Bonjour, NetBIOS and UPnP; DNS lookup and reverse DNS lookup; internet connectivity checker; ISP analyzer; ping; port connector (browser, FTP, SSH); port scanner; subnet scanner; traceroute; and Wake On LAN. Fing is free, and you can use it on its own, but it's also designed to work with an optional device, Fingbox, that retails for $100. It provides additional tools to let you do more in-depth analysis and security: block devices from your network, measure signal strength of your Wi-Fi network, secure your Wi-Fi network by monitoring nearby devices and troubleshoot issues with your network's internet connection. There are several remote desktop apps that let you use your iPhone to access and fully control a server or another computer on your office network. They work similarly: You download and install client software on the computer or computers that you want to be able to control over the internet. You set a login for each computer. Finally, you install an app on your iPhone that you use to sign in to your computer.